There’s no other thing to book before everything else but the church. The sacred union will take place there. The magical place where you will receive the sacrament of matrimony. So before we book anything else, we made sure that the church is already booked and secured. We got engaged on October 7, 2018. After letting that sink in for a month and after scouting for the perfect church for our big day, we finally found “The One” and booked it on November 3, 2018. Luckily, they are already accepting bookings for 2020 weddings. We booked the very simple San Roque Chapel in Subic. We didn’t originally plan to have our wedding in Subic. Since the fiance is from Pampanga and I am from Bataan, we knew that it’s gonna be in either one of those provinces. So, how did we end up in Subic? Here are our considerations before booking a ceremony venue. It has to be air conditioned. My tolerance for heat isn’t very high. Plus, who wants to walk down the aisle sweating, right? So, I started googling air conditioned churches in Bataan and Pampanga. The options aren’t too many. I wrote the list of churches in my notebook and googled them one by one. Arzobispado De Pampanga in San Fernando, Pampanga. – This is where the fiance’s sister got married last September. The church is good and there is a function hall at the back where the reception can take place. We will save so much time and money. But, the fiance doesn’t want to get married in the same church where her sister got married so we crossed it out. St. John Paul II Parish in Lakeshore – Mexico, Pampanga. – I like the minimalist altar of this Parish. It looks very simple and neat. However, we crossed it out as well as Lakeshore is not very accessible especially to guests who don’t have a car. St. Peter of Verona Parish in Hermosa, Bataan. – It has a look of a classic and traditional church. But, it didn’t give me the “this is it” feeling. Though the inclusions are many and will cover most of the services needed, we still find it too pricey. Also, it is very far and we didn’t want to cause too much hassle to our guests. Also, the chapel inside Las Casas is just a replica. It doesn’t look good in pictures and videos. So, goodbye, it’s not my dream location after all. Chapel of Jesus and Mary at Cana in Holy Land, Subic. – This also caught my attention. The church is very classy. Holy Land is a place in Subic where people go for pilgrimage. There are picture worthy spots inside the Holy Land. There is also a tent inside where they hold wedding receptions. So, we really considered this church. I even asked a friend Pam to inquire for me. So she called them and was able to talk to one of the staff who promised to send her the fees but did not. So, I just asked my brother to have an ocular visit and to inquire personally. I cannot do it myself because I am working abroad. Later on, we found out that the visit should be scheduled. We were able to schedule our visit but did not push through after realizing that Holy Land is not accessible to guests without a car. Another thing is, the reception venue is a tent and we are a bit hesitant to hold our reception in a tent. San Roque Chapel in Subic Bay. This church, from the very first sight, gave me that “this is it” feeling. I fell in love with the all white facade of the chapel. I love the minimalist style of the chapel and there is a huge space outside with lots of trees. The trees provide a lot of shade and fresh air. Even its altar is very simple. The only think that bothers me is that the aisle space is a bit narrow and short and it is not allowed to close the church door during the whole ceremony which means there will be no dramatic door opening for the entrance of the bride. Maybe a curtain entrance will do the trick. But, overall, it’s good. I showed it to the fiance and he instantly fell in love with San Roque Chapel as well. So, there’s nothing left for us to do but to book it. Thanks to my family who is a family of Methodists for being so understanding and for supporting my decision to marry in a Catholic Church. Since we are abroad, I just asked my family to personally visit the church and to ask for the fees/ donations. – 12,500 Php for local parishoners and 15,000 Php for non-parisioners. This fee is mainly for the ceremony venue and air conditioning. The styling, choir, and other requirements are not included. They will require you to pay the 50% of the Church fee and the Officiant service fee. Fortunately, I was able to go home to the Philippines last month (January 2019). The first thing on my To-Do List is to visit San Roque Chapel. It is heartwarming to see it for the first time. I took a moment of silence and meditated for a while. I stood inside. Alone. Closed my eyes. Took the moment in. Opened my eyes and walked down the aisle. I teared up a bit. It gave me goosebumps and it kinda made me realize what is really happening. I AM REALLY GETTING MARRIED. IN THAT VERY CHURCH AFTER A YEAR. I knew it right at that very moment that we booked the perfect church for our union. Praise God! Booking the church took as a big step forward into planning. Booking it is like making a promise to God. A promise that noone can ever seal our relationship but Him. We would love to start our happily ever after in His presence. After all, He is the one who wrote our love story. He is the one who lead us to each other. He is the one who sustained us in difficult times. We are forever grateful. In that very church, we will make a promise to love each other because He loved us first. Remember when we were kids? There was a point in our childhood when we used to transform blankets into wedding dresses and dream of being a bride. We used to watch fairy tales and confidently tell ourselves “Someday, I’m going to meet my Prince Charming and marry him.”. Then, when we entered our teenage years, we started to practice writing our names with our apple of the eye’s last name; we fantasized about creating a family with them; we played FLAMES with our crush’s name and get so frustrated whenever we get “Angry”as a result. We used to do it over and over again as if doing it a hundred times over can change the result. Back in grade school, I remember my teacher finding my love letter to my childhood crush. The note says “I love you, Mar__.” I was so embarassed. What do I know about love at seven years old? We used to think that love will come easy. That all we have to do is to leave a pair of shoe and let our prince find his way to us so we can start our happily ever after. As I grow older, life taught me that love isn’t the easiest thing to find. I am a late bloomer. I still played with Barbie Dolls when I was in high school. When I went to college, I still cried when my mom left me in my dormitory. But, when I started working abroad, though it was hard at first, I started to realize that I am a strong and independent woman. And being one made me believe that I don’t need a man to depend on. I can do things my own. Or atleast that’s what I tell myself. I remember writing this blog post sometime in 2015, Cheeseburger. Last night, I craved for a cheeseburger. I thought how nice it would be to have you around to buy me one. How easy and nice life would be if I have you as a constant run to person. A comfort zone. A secret hiding place. But instead, I found myself walking along the dark pavements of the street going to the nearest restaurant. I got myself a cheeseburger. After eating it, my craving isn’t satisfied. Then I realized, it wasn’t cheeseburger that I was craving for. I was craving for you. No matter how independent we think we are, there will come a point in our life when we wish for someone. When my friends started getting married and having kids, I started to develop an unknown fear of the future. It might be because the society tells me so. I never had a boyfriend. I am not getting any younger. I didn’t even have a love interest. Some days I don’t mind being single, but some days, I have an intense longing. I have spent my single life going out with friends, shopping, doing what makes me happy and not being sorry for it. But as years went by, I slowly outgrew these things. My closet is full of clothes, bags, and shoes but that special area in my heart feels empty. It’s not that only a romantic love can fill that void in our hearts but I know it can make a difference. Our hearts have always been full the moment we let God in. And I believe that even God dreams of sharing our hearts with an angel on earth that He has prepared for us. Because God wants to see us happy. Because God uses people as an instrument of His unconditional love for us. But because I am a woman, I can’t court guys I like, I can only pray for them to like me back. And if they don’t, then they are not God’s best for me. All I can do is wait. Wait with joy. Wait with God. My season of waiting is not a walk in the park. I’ve had heartbreaks but I also realized my worth. I am God’s princess after all. I have found peace in waiting. Trusting God’s better plan. I let go and let God. A lot of people tell me that maybe I have high standards. I just laugh whenever they tell me that. What do they know about my standards? I wrote my negotiables and non-negotiables. My standards are not high. My standards are just right. I always tell myself and others that I want to marry at the age of 32. That if I will have to marry someone. I want to marry someone who loves his family especially his mom. I want to marry someone who’s intellectual and speaks really well. My aunts sometimes joke that I should find a news caster for a boyfriend. He was introduced to us as one of the newest Singles for Christ (SFC) member. He moved to Qatar from Manila and was integrated. When I heard him speak in front for the very first time, he speaks really well, I remember giving that “look” to my friend, Diana. A look that says “pwede!”. New crush mode activated. Then later on, I found out that Diana has a crush on him too. So I just gave way. Years passed, we forgot about him, made new crushes, and moved on with life…as a single person. A single and strong and independent woman. Arjay went on with his life, too. He pursued other girls. He didn’t have an eye for me. His heart got broken too. He embraced the pain, he moved on until he was healed. Then, a brother told me (Hi, Bro. Tristan! ); “I think you will have a GG (God’s Gift – a term use in SFC referring to a boyfriend or girlfriend) this year.”. The thought iself gave me butterflies. But, I don’t have anyone in mind. I don’t even know if I am ready for it. So I didn’t have expectations. Soon after, I moved to a new house. It was in the same compound where Arjay stays. A sister even joked and said “Uuuyyy, lumalapit sa pag-ibig.” I didn’t entertain that thought because first, Arjay is not my crush anymore; I even said that I find him boring. Second, we weren’t even close, he’s just an acquaintance. Lastly, I wasn’t focused on finding someone at that time. I was in my YOLO stage. I was busy enjoying my life. Fast forward to that time in February 2017 when he invited me to join him, his family, and some of our friends who are in their house having tea. I was fighting jetlag at that time so I thought it wouldn’t hurt to join them. So I did. We had a great time. We made Valentine’s Day plans, he told me to come with them if I don’t have other plans. He started to constantly message me. Constant good mornings and good nights and anything in between. I told myself and my friends, I wasn’t ready for it. I had a butterfly riot in my stomach. My friends told me to just enjoy it and not to overthink things. But, I just can’t. He confessed that he likes me and wants to pursue me if I will allow him to. With all my strength, I gave him the go signal. Love is something new to me. We stumbled and failed many times so I decided to tell him to stop. He complied. We never saw each other for months, we never talked, not even a word. I won’t elaborate but those times were hard. Until God made a way for us to reconcile. God brought us back to each other. Our relationship is not an ideal one. Sure, we fight a lot. We both have our shortcomings. We don’t always see eye to eye. We hurt each other unknowingly. But, as time passes by, we have learned how to deal with our differences, we learned how to understand each other, we learned how to compromise. Our love grows stronger. It is strong enough to endure every misunderstanding, to accept all our differences, and to surpass every challenge. We chose not to give up even if life tells us that it is the easiest thing to do. We made a promise not to give up on each other. We’ve been through a lot and we always remind ourselves that giving up is not an option. It will never be an option. Our relationship got better in time. Thank You, Lord. It has been God who is working for us and with us all along. We used to talk about getting married. I used to daydream about the day that I will marry him. We weren’t even engaged but I asked him if it’s okay if I will start to write down wedding ideas. He said it’s fine. I bought a notebook and I started writing down wedding plans. But, I laugh whenever I do so. It’s funny, I wasn’t even engaged. So, I stopped. He had fake proposals. There was this one time while watching “A Walk To Remember”. When Landon proposed to Jaime, he re-enacted the scene and asked me to marry him. He said just because we didn’t have a ring doesn’t mean we’re not engaged. The ring is just a fad. I was so confused. Then, when we went to the Philippines for a vacation together. We were sitting under the stars when he started talking about how our wedding will be. I told him, “but, we weren’t even engaged yet.” and he started giving me lectures on how the ring is just a craze and not really a tradition. That people can get married even without a grand proposal. I just threw tantrums at him. A lot of people expected and assumed that he will propose in the Philippines. I never expected him to propose though there were moments and places that look perfect for a proposal. But I know him, he will not do what others are expecting him to do. In short, I came back to Doha without a ring on my finger. And I am totally okay with it, I know what we are and I am certain about our future together. I told him about my dream proposal. I said I want it to be well documented and I want him to sing “Marry Your Daughter” to my dad. “Not gonna happen.”; he said. Whatever. Haha! October is my birth month. My birthday is on October 6 and our anniversary is on the 8th. He told me to enjoy my birthday with friends and we’ll just have my birthday dinner on the 7th; just like last year. I said okay. Days before, he constantly reminds me about it. I asked him what should I wear. He didn’t tell me where we’re having dinner. He wants to keep it as a surprise. I told him I don’t want to be underdressed or overdressed. So, he took me to the mall and bought me a dress. He said that’s the appropriate dress to wear. He encountered a lot of challenges along the way, he lost his car key so he ended up getting an uber to pick me up. I still have no idea where we’re going. I made a lot of guesses. We were heading to West Bay area. I saw a glimpse of Sheraton Hotel. Then I remember his promise to take me there someday. I was right. It was the fulfillment of his promise. We reached the Nusr-et Restaurant. I was greeted with a happy birthday song, a bouquet of red roses, and a whole lot of smoke for a dramatic effect. When we finished dinner, we headed out. He told me beforehand that he prepared an outdoor activity. The activity requires a blindfold. He blindfolded me. He told me to just trust him. While blinfolded, he asked me to rate my happiness at that point in my life. 10 being the highest and each number is equivalent to 10 steps. I told him 5, because my life is a balance of happiness and sadness. He told me to take 50 steps. After 50 steps, he asked me if I want to be happier. “Of course.”; I said. Then it was followed by a question, “What are you willing to do to be happier? Are you willing to take a risk and move forward?”. I thought about it and said yes. He asked me how many steps am I willing to take to be happier? At first, I said 20 more steps then decided to take 50 more so I can reach a hundred which is the perfect happiness. After 100 steps, we didn’t reach the venue so he quickly think of something to say just so I can take few more steps forward. He said, “Do you know that even if you already reached the perfect happines, you can still be happier?” Then he told me to take 10 more steps forward. Then he told me to sit down. I still had no idea where we are at that moment. I felt the couch. He sat beside me. He asked me about my realization regarding our activity. My realization was “In life, we can’t be stuck. If we want to be happier, we have to move forward. We have to take risks. We have to walk towards happiness and sometimes though we are already happy, we can still be happier.” Then he removed my blindfold. I was in awe of the place. It was beautiful. It was perfect. It was in a canopy by the beach with dim lights and with rose petals everywhere. It was a romantic spot. I uglycried some more and cried again until he took the ring from his pocket and put it on my finger right after I responded with. “Yes. I can’t wait to spend the rest of my life with you.” Everything was followed with a lot of ugly crying. Then 3 of my friends who documented everything popped out of nowhere and congratulated us. Thank you, Josh, Deej, and Diana. Everything felt so surreal. We spent the night talking about how he managed to pull it off. I honor him for giving me that magical proposal. It is truly the most magical moment of my life. I don’t know what I did to deserve it but it is an affirmation that God sent me a man who will go out of his way to make me feel loved and special. To make me feel that he loves me with the love of the Lord. And, I love him just the same. We have come so far and we still have a long way to go. As we gather all our strength and courage, please journey with us as we take the blessed sacrament of marriage. The future isn’t a scary unknown anymore. The future is so much brighter. The future will soon make up for my past. My childhood roleplay will soon become a reality. If God wills it, then it is what’s best for us. I never thought that my heart can contain a love like this. Thank You, Lord! So here’s our Korean Adventure Day Two. I must say our second day is the most tiring but it is also the richest in culture. We started our day with the usual free breakfast from our hotel. We had cereals, fried egg and toasted bread. We can only hope that it will sustain our energy until half of the day. With our black boots on, we headed out to the streets of the shopping district – Myeongdong! Myeongdong was full of shoppers and tourists when we arrived. So that morning, we took a little time to explore it before we headed to our first tourist destination. It’s nice to see the streets clear with people. A perfect time to take blog worthy photos. On our way to the Gyeongbokgung Palace, we saw a group of people wearing Korea’s traditional dress, Hanbok. We were so fascinated that we even followed them anywhere just to take stolen photos of them. We were clueless that by the time we enter into the palace, there will be hundreds of people who are wearing the same. We can even rent our own Hanbok and wear it ourselves. There are plenty of Hanbok Rental stores to choose from. We entered one near the palace so that we will not have a hard time returning it. You can rent the Hanbok and wear it anywhere you want for 6 hours. We chose not to go far from the shop so we will not have to come back again to return it. We just need a few pictures wearing them. But, you can never have enough photos wearing their traditional dress. There are a lot of designs and sizes to choose from. Mix and matching took us a while before we finally settled. I chose a blue one and my friend, Jillian, chose a pink one for herself. We could pass as a Korean for a day. Prior to this trip, we already planned our photoshoot. Here are some shots. When we’ve had enough taking photos of ourselves wearing Hanbok. We just stood by and waited for the changing of guards. It’s nice to witness such activity in the palace. Half of the day is almost over. We had a mini break in a park inside the Palace – my favorite place. We did some people watching while eating dewberry cookies which Jillian brought from the Philippines to save us from hunger in the middle of sightseeing. I could stay here all day. I just love how quiet and peaceful it is there. The colorful and intricate details of the Palace’s ceiling. Once we had enough of the palace, we just took few more photos and then we headed to our next destination. The Bukchon Hanok Village. We had a hard time locating the village. We were already exhausted and very hungry. We didn’t even have the energy to explore the place. We just took some photos and we went to find a place to eat. Our feet brought us to the nearest restaurant. We had some kimbap and chicken for lunch. Here are some of the photos that we managed to take in the village before we lost the hunger game. On our way to our next destination, we grabbed a Koreak bread that tasted really good. I just don’t know what it’s called. One thing is for sure, it’s perfect for the cold weather and it is yummy. We wished we bought more. Here’s Jill modeling the bread. Our last stop for our second day, the Cheonggyecheon Stream. We originally planned to visit it on our fourth day but since it’s near the Gwanghwamun Square where we went to search for the outdoor ice skating rink which turned out to be a big parking lot and since it’s not snowing at that time, no ice skating rink was found; so we just decided to walk going to the Cheonggyecheon Stream. It is open for 24 hours for those who wanted to relax while listening to the sound of flowing waters. It was filled with people but thank goodness we found a good spot. It’s just so good to sit down, talk, and relax there after a very tiring day. It’s time to go back to our hotel and have a restful sleep. As usual, we grabbed a snack on our way back to the hotel. We grabbed a Korean Carp Bread with red bean inside. As expected, it was good. And for our finale, of course, just like the usual, the streets of Myeongdong! We had Myeongdong’s street food for dinner! hahaha! Myeongdong is totally different at night. It’s so lively and packed with people and colorful lights. That concludes the second day of our Korean adventure. I can’t wait to tell you about our experience in Nami Island and Petite France on our third day. I used to picture out love like stars in the sky – shiny and extravagant. I used to believe that it will give us endless and constant butterflies in our stomach. I have pictured a fairy tale kind of love story. I have always been a damsel in distress waiting for a knight in shining armor to save me from the mess I am in. I imagined someone who will give me the moon and the stars in the sky. Who will do whatever it takes to win my heart. Who loves me like I have never been loved before. I imagined waking up with flowers everyday. I imagined having someone whom I can call anytime of the day when I feel like the whole world is against me. I imagined myself never having to eat alone. I have always thought that it would put an end to my late night emotional breakdown when things get rough. I imagined seeing the world with the most important person beside me. I imagined someone who sees the best in me even at my worst. I imagined everyday reassurance and affirmation that I am doing just fine; that I am enough. I imagined love to be perfect and too big to contain. I have always thought that love’s extravagance will sweep me off my feet and will keep me wanting for more. I have dreamed of my happily ever after even before I met a prince. I have waited twenty nine long years to get a taste of this thing called love. It was never a priority to me. I was contented with the company of family and friends. I am a strong and independent woman; a princess who wasn’t owned by a prince. I spent twenty nine years of solittude and for a time, I thought that I will never need a man to make my life more meaningful. Until one day, unexpectedly, someone brave enough knocked on my heart’s door and crashed the walls I have built around my heart for the past years of total independence. There he was, smiling the sweetest, his dimples making it a lot more sweeter. Being new to it made it very challenging. I got a taste of what love is really all about. It’s not a walk in the park. It’s not about smelling flowers. It’s not about being in cloud nine. Butterflies in the stomach aren’t always there but a physically painful heartache is as real as it can be. I spent most nights crying. I have doubted and blamed myself. I have felt love sliding through my grasp. I had let go of it once no matter how much I wanted to keep it. But love has its own way of finding its way back. Fortunately, God blessed the broken road and lead it back to where it should be. Though I still secretly long for the extragance of love, I have also realized the warmth little things bring. I value quality time. A lot. I believe quality time opens the door to more heartwarming moments. Togetherness brings comfort – the feeling of safety. Like nothing can harm you. I love crashing into my Love’s arms when I am having a bad day. I love overcoming challenges with him. I love building dreams with him. I love being enveloped in his arms. That’s the safest place I would want to be in. I love reading little notes from him. I love daily breakfast supply; not the food but the effort he puts in preparing it. I love it when he holds my hand while he drives and when he kisses it everytime the traffic light turns red. I love when we sing along together in the car. I love sharing many good meals with him. I love it whenever we talk about the future that seems so bright. It makes me wanna travel to the future as fast as I can. I love it whenever I win over sleep because I know sleep for him is like air. It is essential to life. I love sitting on the couch with him laughing at the silly things Vice Ganda says. I love being silly with him and laughing with him. I love our movie nights. I love cuddling with him. I am always at peace. I love seeing our picture as his wallpaper. I love it whenever he encourages me to do something I believe I can’t. I love knowing he’s excited to meet my family and friends. I love how he makes me feel that his family is my family too. I love how he looks forward in building our own family. I love it whenever he silence my irrational thoughts and reminds me to have a little more faith in our love. I love seeing him happy. I love it whenever he smiles. I love it whenever he assures me that he will love me despite my double chin and extra belly fat. I love it whenever he surprises me with my favorite ice cream. I love waking up to sweet good morning messages even though the sweetest goodnight message from last night is still fresh in my memory. I love the little things he does for me. I love every little thing we share. I love having him around. The little things. The little moments. They are not little. They are truly the big things. This is the only love I am longing for. Simple but heartwarming, assuring, understanding, accepting. Imperfect but real. We owe it to the little things. I have experienced a lot of lonely nights in my life. Every lonely night hurts but to a different extent. It is not new to me anymore. I have always thought that I am wired for it. It was Good Friday. The day Jesus Christ died for our salvation. I went to church for the stations and veneration of the cross. The experience was overwhelming. It is good to be reminded of Christ’s passion just to save us and to show His love for us. I was seated with a woman who had her hair covered with a scarf, with pale skin, and dark circles around her eyes. It seemed to me that she is a cancer patient. The veneration of the cross was a series of standing up and kneeling down. In the middle of it, she got tired and her deep sighs told me she was in pain. I heard the lady beside her told her to just sit down or just stand up so she will not get tired of moving. That’s what she did. After the communion, as we were silently praying. I can hear her cry silently. She might probably be praying for healing. My heart grew heavy. I can feel her pain and helplessness. “Lord, I am offering prayers for the woman beside me. Please grant her healing, Oh Lord.” I mentioned in my prayer. Oh, the joy of praying for others. We all have a different cross to carry this season of Lent. It’s just up to us whether we look at it as a burden or to carry them joyfully. I had another lonely night last night. I was scrubbing the bathroom floor while crying. There was a deafening silence in the room. This might sound too dramatic but I felt like I was abandoned by everyone. I can feel the physical pain in my heart. It was too painful; I had to rub it gently so it would calm down. I tried to divert that pain into tiredness. After doing all the cleaning, I went to the bathroom to freshen up. I stared at myself in the mirror. I looked like a mess. I cried for a few minutes. Washed my face and went back to my room to rest. I was home alone. It was too lonely, I was deafened by the complete silence. It was too quiet I can hear my thoughts. I consoled myself. I fried an egg for dinner. I usually fall on self pity in times like that but that night I couldn’t be more thankful that I have that sunny side up on my plate. “I feel lonely.” I told my egg. The egg made no response. I just decided to eat it. I may be lonely but atleast I am not hungry. I switched the lights off my room. I originally planned to reflect for the night but my thoughts are too loud. So I just held on my wooden cross instead. Like I always do whenever I feel down. Hugged it so tight until I fell asleep. I woke up in the middle of the night with a heavy heart. The kind wherein you can’t pinpoint which part is hurting. All you know is that a part of it is broken. Shedded a few tears. I wish I can say that it’s just because of the bed bugs’ bite but it wasn’t. It was something else. Something deeper. I stared into darkness. Evaluated my life. I started to miss home. I just want a hug from my mother. But, no one’s left to hug. I hugged my pillow instead and tried to fall back to sleep. Unsuccessful. But, I am thankful. It gave me the chance to finally reflect. The silence is not deafening anymore; it’s actually comforting. The night is too quiet. I feel like the only person awake and I feel like I have God all to myself. I cried out to God. And though Jesus Christ is dead during that time, I was still able to feel His love. Because hey, He died for my sins. They say the most beautiful of loves requires the heaviest of sacrifices. Some has to carry a cross of sickness, just like the woman I sat beside with in church, some has financial difficulties, some has broken relationships, some has problems at work, some has inner struggles they never talk about. The lonely nights are the cross that I have to carry during this season of lent. I have had a lot of it. I was tempted to put my cross down but God’s love sustained me. We all have to go through our own passion. We all have to die to ourselves just to let others live. We all have to stay in the wilderness (for me, the lonely nights is my own kind of wilderness) so we can experience the joy that comes in the morning. God’s love will pull us through. I can’t wait for my own Easter. The pilot said his final announcement in a very monotonous voice. No sign of excitement for making it alive after a nine hours direct flight from the Philippines to Qatar. This best describes my feelings at that very moment. My cousin who traveled with me brought my carry on luggage down and I dragged it out of the plane. That sign welcomed us at the airport. It means my cousin and I had to part ways. My final destination is Doha while my cousin still have to wait for his flight bound to Oman. We stood under the sign and said our goodbyes then we turned our backs and went our separate ways. That’s it. The last person who makes me feel closer to home was out of my sight. Reality set in. I had to walk out of the airport alone. I am really back. Qatar and I have this love-hate relationship ever since. It has cradled me for the past nine years but it broke my heart countless times. But, I am here and I am back whether I like it or not. I stopped by a rest room to put on a red lipstick. I feel stronger when my lips are red. It hides whatever anxiety I am dealing with. The airport corridors were clear with people. My co-passengers are probably waiting for their luggages while I am walking alone on my way to the immigration. I appreciate that tiny moment of solitude. It helped me sink in the fact that I have to spend another year before I get to go home to my family again. I was staring blankly while walking until I reached the conveyor no. 3. I watched the luggages and boxes go round and round. I have been staring at the conveyor for a very long time and I didn’t get a sight of my boxes yet. I waited a little longer before I approached an airport officer to ask if the check-in baggages for flight QR 931 is in conveyor no. 3. Then he said, it’s in conveyor no. 8. I laughed at myself and started walking towards the right conveyor. My boxes were there enjoying their time circling around. I was the last one to get my baggages. I felt like I own the place. I took them out of the conveyor. I saw what my cousin wrote on my box before I left home. She wrote: #YourMomNeedsYou. Right there and then, I was reminded of my purpose. I am so ready to work harder and endure lonely days and nights again. Okay, so I can no longer prolong my time. I pushed my cart out of the airport. In a big crowd, my eyes went looking for a familiar face. There he was, with shining eyes and a bouquet of flowers in his hand, greeted me with a big smile and wrapped me around his arms; the most comforting embrace. I told myself, “I am home.”. Being back doesn’t feel that bad anymore. The end of missing someone. And I am so proud on how we managed to endure two months of being away from each other. Thank You, Lord, for the grace. A bucket of Kentucky Fried Chicken was waiting for me when we got home. This made my comeback even more real. Haha! I came home to a messy (this is an understatement) house. I didn’t even know where I can sleep. I couldn’t stand seeing the house like that. It’s not very comforting especially when you are so tired. I put on new sheets and rested on the bed. I was so tired but I couldn’t get myself to sleep even though I was wide awake for the entire 9 hour flight. I got up and tried to declutter the house a bit. I tried to unpack some of my stuff. It was already six in the morning when I felt the need to go back to bed. I think I was able to sleep for two hours before I woke up chilling. I felt cold. Yes, I was right. I woke up with a high fever. Maybe I was just tired but I was sick for three days. Thank you for a very sweet welcome, Doha! Well, being sick extended my vacation for three days. I never got the chance to enjoy it though because I was in bed feeling cold and sickly. I couldn’t even eat properly and catch up with people. After three days, I resumed to work. It’s not my favorite thing in the world. But, it is something that I will have to eventually face no matter how long I prolong it. I have been here for two weeks now. I couldn’t believe it. A lot has happened over the past two weeks. I am back to dealing with lots of issues and anxieties. I have to face the same struggles at work. I have to keep moving forward no matter how much I miss home. 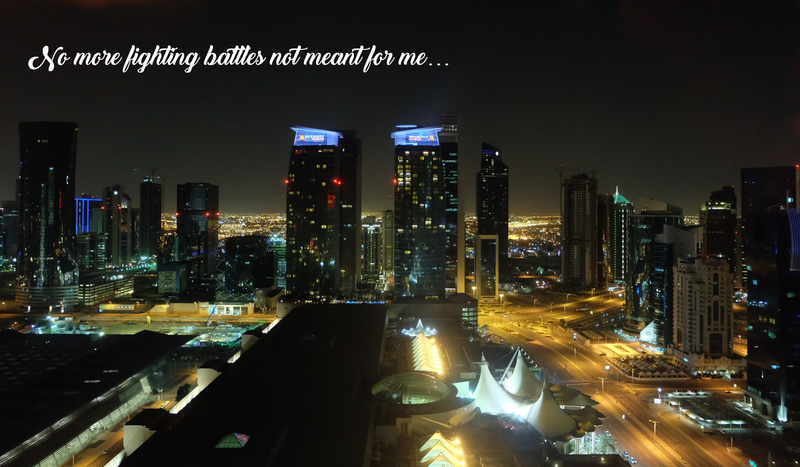 I have to overcome challenges and inner battles. Did I mention that I have made Sesame Street’s “Elmo’s Song” viral in the office? I told them that that’s our happy song and when things get a little harder to bear in the office, just sing it and they will be happy. I can only hope that it’s effective because for me it is. (La la la la, Elmo’s world! La la la la, Elmo’s world!). I have also tried singing that while stuck in traffic with windows down just in case someone on the road is having a bad day. I just love being a wounded healer. Until I came across the THE POWER OF NOW in the internet. It says, in our current situation, if we can do something about it, we have to do it now; if we can’t do anything about it, we have to let it go. I am still trying to figure out what to do. Sometimes life is just so confusing. I am still trying to sense where God is leading me. For now, I will just rest on God’s promise of a future full of hope. If I survived two weeks, I think I can survive more. Will you pray the serenity prayer with me? I know you have always wanted to do it. It’s about time that you brave life and do what you have been praying for. I know you have been holding on for so long. It’s about time you let go. It might hurt but things will start to feel better eventually. I know you are tired. You have all the right to feel that way. You deserve a break. Go take it. I know you are scared. Who is not anyway? But sometimes, you have to do it afraid. I know you are broken. I understand. You have been through a lot. I don’t even know where you got all those strength from. It’s okay. Don’t you know that broken crayons still color. Broken hearts still beat. God gave you life and He will sustain you wherever you go. I know you still want to try. I think that’s brave. But, is that you’ll ever do? Just try? I know you’re not doing this for yourself. Oh yes, that is selfless. But, isn’t it time to put your dreams first? Stop putting them on the back burner. I know you can still hang on. But, it doesn’t mean you have to. Stop making yourself believe that you can do it. Because it’s okay to admit that you can’t. It is okay to quit. That’s the only way to be free. Do not lose yourself in the process of chasing dreams that aren’t even for you. Let your dreams die so you can start dreaming again. Life failed you a lot of times. You failed at life a lot of times. But, it only made you better and stronger. And now that you are stronger, you can conquer more of the world. You can dream bigger dreams. You can aspire greater heights. You can jump into the unknown. You can jump higher. You can jump. Believe me, you can. Do not be afraid. Do not hold back. Just go for it. How many times did you promise that to yourself? Isn’t it time to give yourself what it deserves? Trust God more. He knows what He is doing. You passed His test of resilience. It’s okay to tell Him that you cannot do it anymore. He will understand. He always does. He is a God who has big dreams for you. Do not confine yourself in the tiny little world that you are in. There is more to life. See it. Experience it. God knows you deserve better — the best even. Don’t chase dreams. Chase God who has dreams for you. All this time, God is fighting battles with and for you. Isn’t it enough assurance that He will fight for you whichever path you choose? You are the happiness that you are longing for. You are the joy that have been missing for so long. You are that one thing that can fill the emptiness that you are feeling. You are the dreams that you are afraid to pursue. You are the strength that you need. You are the courage you never thought you have. You are the love you never received. You are loved. Because you know why, dear heart? All this time, God is inside you. Now, go and let God take you to paradise. Let God heal you. Let God fix everything that is broken. All those years of pain, dead dreams and heartaches, they’re worth it. It’s about time to be happy. Just do it afraid. God will carry you through. I can’t wait for you to be whole again. Chase life. See you in wonderland. I will always be proud of you. I know God is, too. “So, I uttered the serenity prayer, “God, grant me the serenity to accept the things I cannot change; courage to change the things I can; and wisdom to know the difference…”, over and over again until what seemed to be too difficult becomes, not easy, but less difficult. Sometimes we are put in a confusing situation of choosing between letting go and trying harder. That is one of the hardest decisions we will ever have to face in this lifetime especially if both will cause your heart to break into pieces. My life has been a series of letting go. Letting go of my pacifier when I was a kid. Letting go of my mother’s hand on my first day of school. Letting go of my comfort zone when I studied away from home for college. Letting go of my youth when I decided to work abroad right after graduation. Letting go of my pride for my first job. Letting go of my hope when my first business attempt failed. Letting go of my dreams when I realized that I don’t have one anymore. Letting go of everything that is beyond my control simply because it hurts. My hand is like a broken vessel where everything just slips away uncontrollably but not surprisingly because I know losing is a part of life and I am wired for it. I am wired for it but I am tired of it. Why can’t I just keep them? I wish I could say that losing things, people, and other stuff taught me a reflective life meaning. But losing those just broke my heart over and over and over and over again. Losing those just made me ask if I am really meant to be happy. Losing those made me wonder how happiness feels like. Because I don’t know how it feels like anymore. But certainly, I know how letting go does. Letting go feels like a long sleep where you are relieved but still feels tired. Letting go feels like keeping tears from falling and finally releasing them. You feel lighter but the pain is still there deep down in your heart. Letting go feels like flying back abroad after a short vacation in your home country. There is a physical pain in your heart, sometimes intolerable, but once you are done with it you will feel liberated and brave just by being able to do it. At the same time, it also excites you of what will happen next. Letting go feels like having a butterfly riot in your stomach. The butterflies that used to give you a happy feeling now started to fight against each other. Letting go feels the same or worse than dysmenorrhea. The pain is sometimes unbearable. You just curl up under your sheets and forget about the world outside the four corners of your room. Letting go feels like a blessing and a curse. No matter how I find words to describe how letting go feels like, nothing seems to be accurate. Letting go is relieving but there is one thing I am certain of, letting go hurts. Letting go is painful. Letting go is hard. But, letting go is inevitable. Letting go won’t kill you (even if it sometimes make you feel like dying) and we all know that what can’t kill you will only make you stronger. Stay alive for the ride. Letting go made me realize how brave I am. Letting go made me feel alive. Letting go made me more prayerful. Letting go allowed me to put my complete trust in the Lord. By letting go, I have learned the meaning of full surrender. As much as I want to keep a grasp of the things that I want to keep in my life, I just opened my hands and let them slip through them. And now, my open hands are ready to receive greater blessings from God who made me let go. The God who provided me grace and courage to let go of things that I badly want to keep. The God who gives and takes away. I have read somewhere that God won’t give us things that somebody else is supposed to have. God takes away for a reason. It might be painful and hard to understand sometimes but God knows what He is doing. Let go, get out of the way, and let God do what needs to be done. Trust. Have faith. Surrender. It is only in losing that we gain. We gain better understanding of ourselves. We gain a clearer view of how we want our lives to turn out. We gain more realizations of what deserves a spot in our lives. We gain more self-worth and self-love. We gain more strength and faith. We only lose what we cling to. If letting go of things, people, and other stuff is the only way to keep them in my life, I am willing to go through the pain. The pain and the fear of uncertainty. The pain of longing for what was once constant in my life. The pain of seeing my high hopes stumble down and die. The pain of seeing my broken walls that seem to be irreparable. The pain of seeing myself that I can’t recognize anymore. The pain of seeing my future that used to be so clear becomes hazy. The pain of not recognizing happiness anymore. The pain of realizing that what was once a reality is now a memory. The pain of losing myself. The pain of missing things and people. The pain of feeling like I could never be the same again. The pain of dealing with anxieties. The pain of the aftershock of letting go. I realized that I don’t really fear letting go, it is the “what could have beens” that I fear. The act of letting go is painful enough, nobody wants to deal with what comes after that. But then, there is God. A God who never lets go. A God who makes letting go bearable. A God who listens, answers, and saves. A God who empties us so we can be filled again. Let us trust the process. To anyone whose goal is to bring joy into people’s lives or to at least just remind people to be joyful all the time. To anyone who knows how to choose when to fight and when to put down the sword and back down for a while. To anyone who believes that sometimes moving forward means taking a step back even if it means breaking his own heart. To anyone who loves without conditions. To anyone who gives without any anticipation of something in return. To anyone who always puts a smile on people’s faces. To anyone who serves God joyfully and willingly. To anyone who patiently listens to people’s rants, outbursts and tantrums. To anyone who always go the extra mile. I want you to know this. http://eckaywashere.com/wp-content/uploads/2017/03/Hey-Winner.jpg 1038 1500 Eckay http://eckaywashere.com/wp-content/uploads/2017/06/ECKAYWASHERE.png Eckay2017-03-13 12:44:122017-07-11 08:14:26Hey, winner!